Brian Yoon is a finisher. The 27-year-old Los Angeles native has made three World Series of Poker final tables in his career, and each and every time he has walked away with a bracelet. Yoon’s most recent victory is his largest ever. He topped a massive field of 6,716 entries to win the 2017 WSOP $1,500 no-limit hold’em ‘Monster Stack’ event, loking up his third bracelet and the $1,094,349 first-place prize. 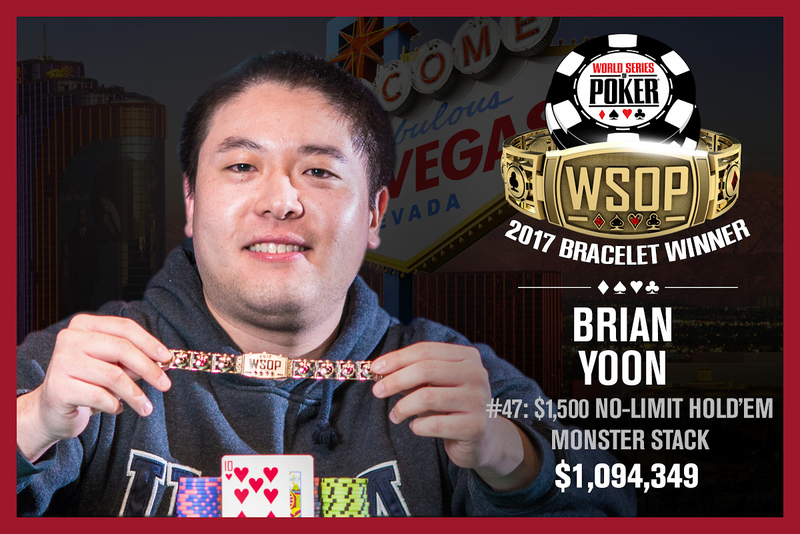 Yoon’s prior two bracelets also came in no-limit hold’em tournaments, with his first title coming in the 2013 Little One For One Drop event and the second in the 2014 $5,000 eight-max no-limit hold’em event. Yoon’s lifetime live tournament earnings now exceed $4.2 million, with titles and 70 cashes accumulated along the way. The ‘Monster Stack’ was introduced as a concept at the WSOP in 2014 and was instantly a huge success, drawing 7,862 entrants in it’s first year. The tournament’s selling point is that it is essentially the main event in miniature, with 15,000 in starting chips and hour-long levels providing more play than is usually offered at the $1,500 buy-in price point. Yoon entered the fourth and final day of this event in 13th chip position with 20 players remaining. Although Yoon was the only multiple bracelet winner left with a shot, there were plenty of tough competitors to contend with including Scott Montgomery (18th – $47,353), Scott Baumstein (17th – $47,353), 2011 World Poker Tour Legends of Poker main event winner Will “The Thrill” Failla (9th – $97,223) and all-time WSOP Circuit gold ring leader Maurice Hawkins (6th – $213,591). Hawkins, a ten-time champion on the WSOP Circuit, earned his third largest payday for his highest ever finish at the series. Hawkins was eliminated by Belarus’s Ihar Soika. Shortly after that Yoon scored a double knockout with his A 8 outrunning the K J of Yuliyan Nikolaev Kolev (5th – $281,800) and the A Q of Ryan McKnight (4th – $374,515). That put Soika and Yoon essentially even in chips with 42,000,000 and 41,000,000 respectively while Stanley Lee wat with 17,000,000. Lee hit the rail a few hands later when his pocket sixes failed to win a race against Yoon’s A K . Lee earned $501,353 for his deep run and Yoon took a 3-to-2 chip lead into heads-up play. Heads-up lasted only 26 hands. Soika was able to close the gap, but Yoon regained control of the match and had roughly a 4-to-1 advantage by the time the final hand of the tournament arose. With blinds of 400,000-800,000 and an ante of 100,000 Yoon raised to 2,000,000. Soika moved all in for just under 20 million. Yoon thought over the sitation for a while before electing to call with the K 10 . He was up against the A 8 of Soika and looking to be in really rough shape after the flop brought the J 5 2 . The 7 on the turn left Yoon needing a non-spade ten or king on the river in order to finish things off. The 10 on the river did just that, securing the pot for Yoon and sending Soika to the rail with $675,995.